Upon our arrival at Cho Oyu Advanced Base Camp a few days ago, we discussed the tragedy on Everest with our Sherpa team and offered to provide any of them with transportation home. The Sherpa community is extremely tight-knit and our small team of Sherpas lost a brother-in-law, a cousin, and several friends in the tragic events in the Khumbu Icefall, so the effects reverberate far beyond Everest base camp. Despite their loss and need to mourn, our exceptional team of Sherpas decided to remain on Cho Oyu with us and continue our climb. 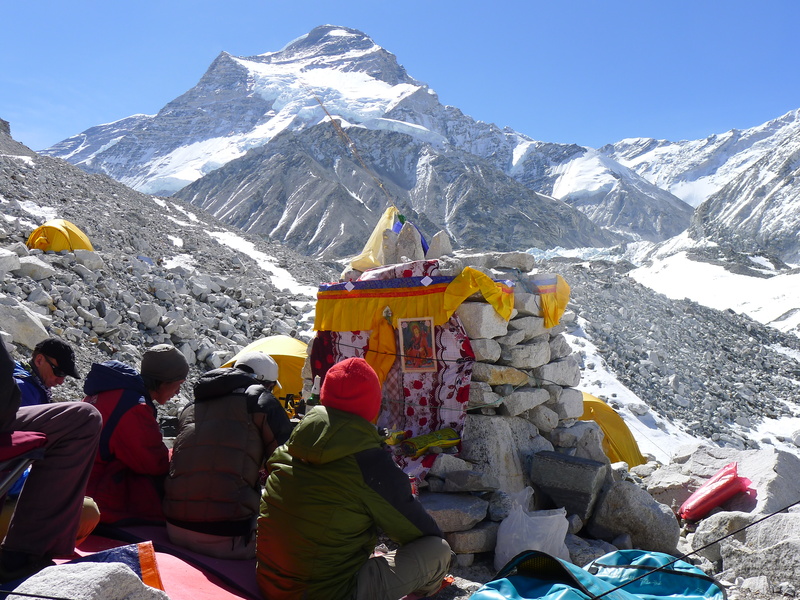 With our strong, small team of Sherpas dedicated to our climb, we held a reflective, heartfelt puja ceremony (pictured above), where we asked the mountain gods for permission to climb, for safe passage, and for forgiveness for using our sharp ice axes and crampons on their flanks. 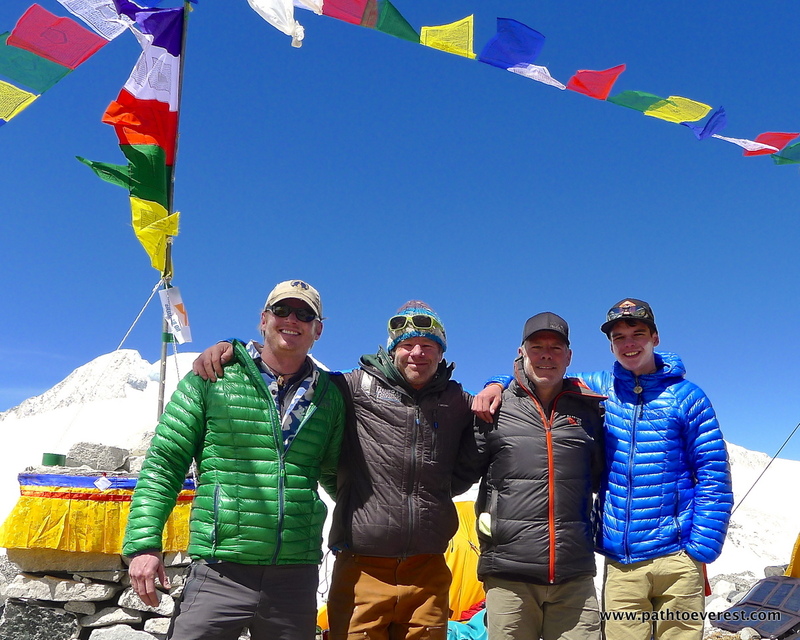 With such a small team and small group of Sherpas it gave us a real opportunity to bond further. We have a very strong team overall, so with some good weather in early May, we hope to find ourselves atop Cho Oyu. In the meantime, there is much work to be done. This began yesterday with a carry to 19,000′ at the base of Camp I, where we cached gear that we won’t need until later in the climb. We will complete the carry to the actual Camp I at 20,500′ tomorrow. At that point, we’ll start doing our rotations where we’ll establish higher camps and sleep there to acclimatize to the higher altitudes as much as possible in anticipation of our summit attempt around May 6th (depending upon weather, etc. ), but much needs to happen before we are in position for our attempt. Finally, there is much in the press about the Everest tragedy and the decisions being made there that will determine if there is a 2014 south side climbing season and that will reshape climbing on that side of Everest for years to come. It was our plan to head to the south side of Everest to climb upon our completion of Cho Oyu, but with all of the uncertainty there we will simply wait and see. We have a formidable challenge in front of us already in attempting the world’s 6th tallest peak, so we’ll stay focused on that for the time-being, assess our options (if any) as they are made clear to us, and take it one bite at a time. This entry was posted in 2014 Himalayan Trilogy Expedition by jwalkley. Bookmark the permalink. Wish you the best conditions and safest climbs. My thoughts are with the Sherpa family’s. Go get ’em, bud. Be unstoppable. Stay safe and positive the universe will reveal its plans soon enough. inspiring to read about your journey. thanks for sharing and keeping us updated. stay safe and wishing you the best weather possible. The McElroy family (Steve, Lisa, Zoe, and Abby) are sending our good will to you. Please tell Mike and Matt that we watch the news for you every day. Zoe misses Matt a lot but is glad you all are safe and happy. We send our love and prayers to the Sherpas and their families. good thoughts being sent to all of you. Trusting God won’t make the mountain smaller but it will make climbing easier. Hope you will be able to climb all your mountains always. Good thoughts to you Matt and Mike.